Learn where you can find analytics for your first send. The home dashboard provides you with important view analytics on your recent message sends. As marketing professionals, we are always looking for new and exciting ways to engage our subscribers and make our campaigns more successful. Information such as message activity, deliverability, activity by regions and even activity by domains can prove to be invaluable. Knowing the time of day in which the most subscribers view and click through your message can help you to better schedule your campaigns to get the most engagement. The more engagement, the more clicks and visits to your site, which ultimately means more revenue. The message dashboard provides all of this information and more. From the home dashboard upon logging in, click on the Dashboard icon under any of your messages. Any time you see this icon, you can click through to a message dashboard. Select a time frame from the preset date range drop-down menu or choose a custom start and end date using the date fields or calendar icons. When finished, click Update. The message overview widget provides several key metrics for your message. View a screenshot of your message by clicking on it to open the message in the authoring page. 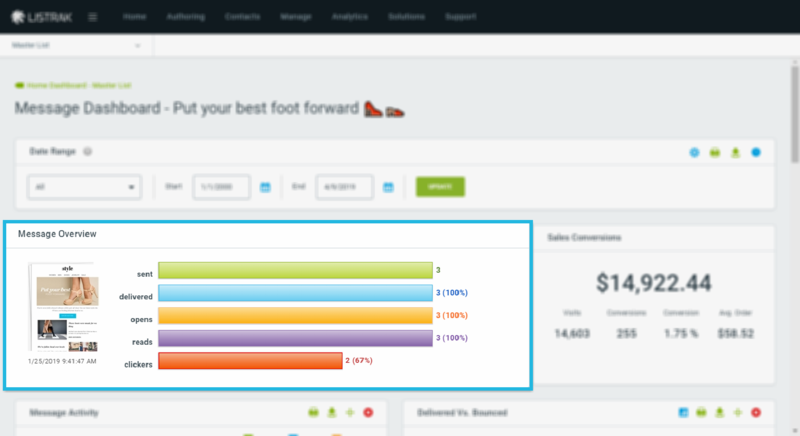 You can see revenue generated by your email campaigns as long as conversion tracking is enabled for the selected list. 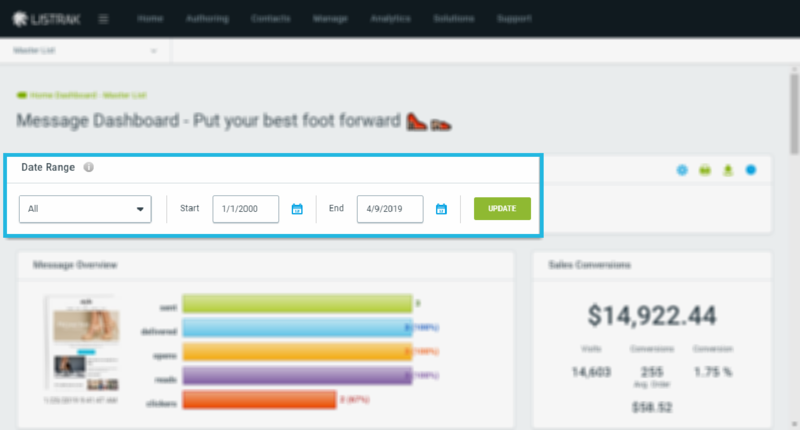 The sales conversion chart shows you the total revenue generated by all messages sent from the selected list during the specified time frame. 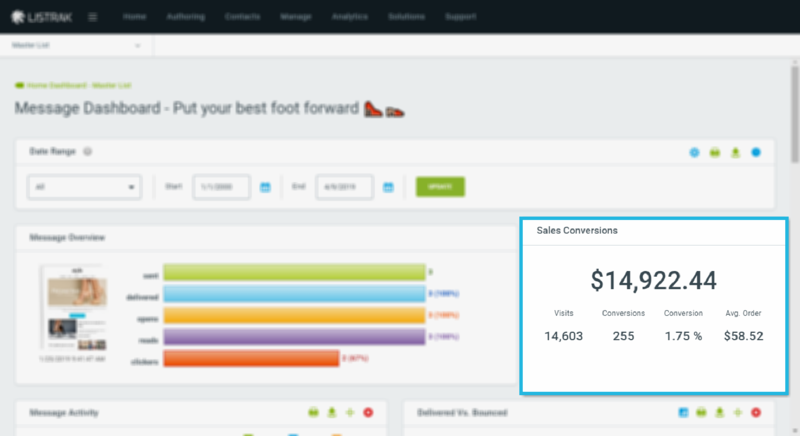 It also displays the number of subscriber visits to your site through your email campaigns, the total number of conversions, the conversion percentage, and the average order value. The message activity widget allows you to see your message activity over time. You can zoom in on the chart to see activity down to each hour of the day. With this information, you will be able to see when people most frequently open, read, and click through on your message. Using this information will help you to better schedule your campaigns to maximize activity. The delivered vs. bounced widget breaks down how many messages were delivered and how many among the messages sent bounced. A large proportion of bounced messages could indicate a problem. Drill down to the message delivery page from this section. The bounce reasons widget provides a pie chart to help you identify the bounce causes, such as the following: DNS failure, blocked for abuse, mailbox full, invalid address, etc. You can drill down further into the widget to the message bounce details page. The delivery domain widget breaks down how many messages were delivered to each domain. This widget can be drilled down into the domain delivery page. The activity by country widget contains a pie chart that breaks down subscribers who have opened a message on the selected list within the specified date range by top countries. This metric can help you target your email marketing efforts by geographic location. You can drill further into this widget into the geo tracking activity page. The links clicks widget breaks down all of the clicks for the message. You can see how many clicks that were registered were message from body clicks (your links) or system links (pass along, unsubscribe, browser). You can drill down into this widget into to message link tracking page. The activity by state widget contains a pie chart displaying subscribers who have opened a message on the selected list within the specified date range by top states. This metric can help you target your email marketing efforts by geographic location. You can drill down into this widget into the geo tracking activity page. The delivery by domain widget breaks down how many messages delivered to each domain. You can drill down into this widget into the domain delivery page. The activity by email client widget contains a pie chart showcasing subscribers who have opened a message on the selected list within the specified date range by email client. This metric can help you to design your messages specifically for the most commonly opened and used email client among your list. The unsubscribe reasons widget provides insight into how your contacts are being unsubscribed. You will be able to quickly see if most of the contacts unsubscribing are due to unsubscribe requests or through issues such as bounces and invalid addresses. You can drill down into this widget into the message unsubscribe details page. The opens by time of day widget lets you see during what time of day your messages are most frequently being opened. By using this information, you will be better able to schedule your sends so that you can maximize the activity and effectiveness of your campaigns. ISPs look closely at the number of abuse complaints received when determining the validity and deliverability of an email message. This pie chart details abuse complaints by ISP during the specified date range so you can quickly determine issues for a particular domain.